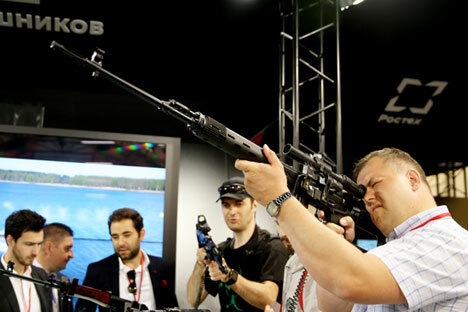 Russia’s Kalashnikov Corporation has signed contracts for the delivery of hunting and sporting weapons to 15 countries and increased its deliveries by more than ten times over the past two years despite the Western sanctions, Head of Russia’s corporation Rostec Sergei Chemezov said. The Kalashnikov Corporation is the producer of the famous Kalashnikov automatic rifle and a subsidiary of Russia’s state hi-tech corporation Rostec. "Over the past two years, the Kalashnikov Corporation has signed contracts with 15 new countries despite the Western sanctions," Chemezov said. "If we look at the corporation’s delivery structure and set aside countries, to which we cannot deliver our products for geopolitical reasons, we have increased the deliveries of civil products by ten times since 2013," he added. According to Chemezov, the Kalashnikov Corporation has traditionally cooperated with African, Middle East, Southeast Asian and Latin American countries. "Over the past two years, the Kalashnikov Corporation’s book of foreign orders has grown fourfold and now exceeds $200 million," Chemezov added.